Buy minimum 1 kg of Mappillai Samba rice and remove the stone & dust if any. Dry the rice under direct sunlight very well. Alternatively, you may also dry roast the rice in a deep pan for 5 minutes. Grind the rice in the flour mill to get fine flour. Let the flour become cool. Then sieve it and store it in an air tight container. This flour remains good for a longer period. 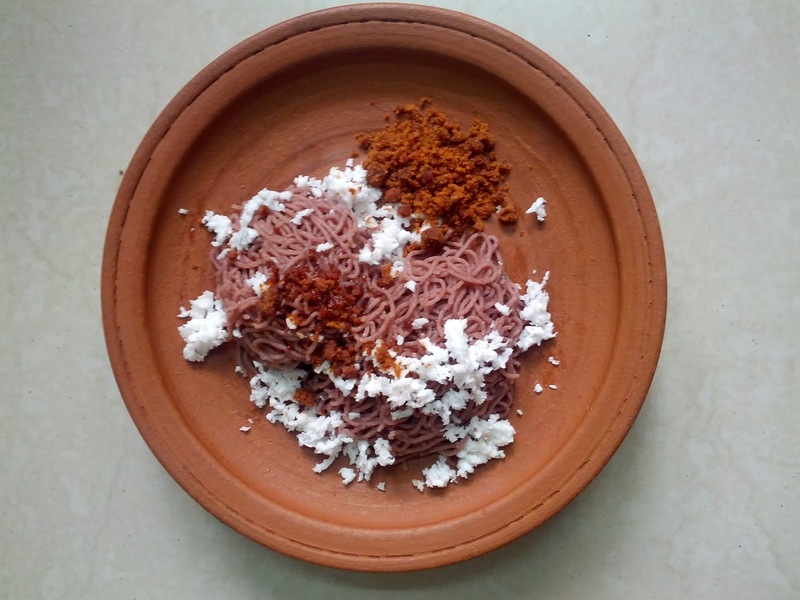 We can use the same flour to make String Hopper, Puttu and Kozhukattai . Put the rice flour in a deep vessel and add salt. 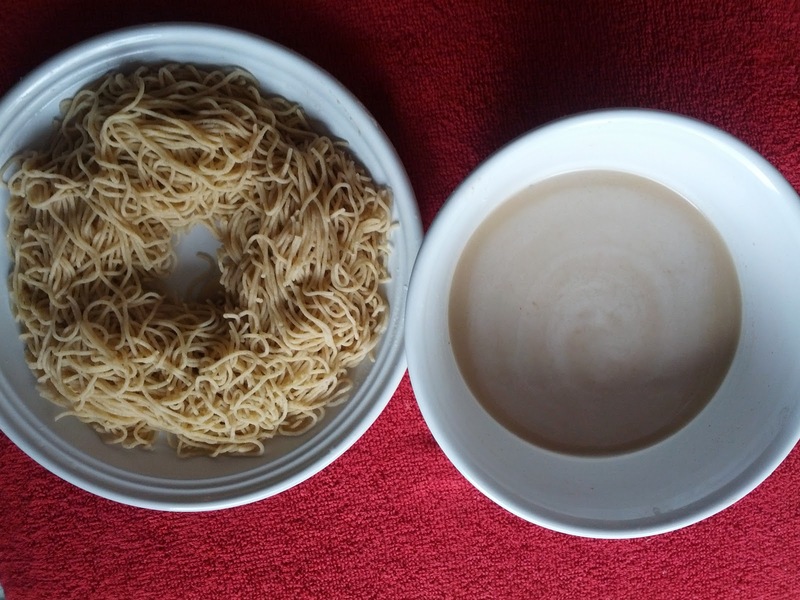 Boil water in a separate vessel. Immediately add the hot water little by little in the flour. Simultaneously, use a wooden ladle to mix the flour and water and make fine dough. You have to be careful while doing this as we are using hot water. When dough becomes slightly cool, take a String hopper mould and stuff dough inside the mould. Close the lid and press it on the Idli plate. You will get thin strings. Place the idli plate in an Idli pot and steam it for 8 to 10 minutes. 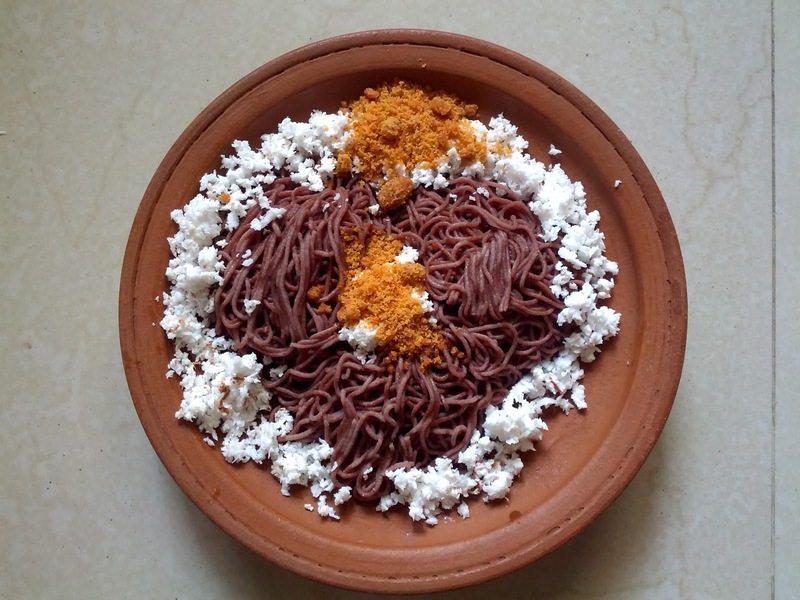 After cooking, add jaggery powder as per taste, grated coconut and a few drops of gingelly oil with the string hopper, mix well and eat. If you would like to make hot sevai varieties, use lemon / coconut / mixed vegetables like how you make it with semolina. I learnt this recipe in ‘Millet cooking workshop’ conducted by Nallakreerai (Good greens) team. Though it seems like the traditional way of making string hopper, many of us might think how to use millet as an ingredient in this recipe. Hence this recipe is given for your reference. In the same method, you can make string hopper with any traditional rice and millet varieties. For sweet variety, you can also eat it along with coconut milk. For that, extract coconut milk, add Palm crystal powder/ Jaggery powder/ Un-refined Sugar (Brown Sugar) and cardamom powder into it. Can you please tell me how to cook mapillai samba rice ie water to rice ratio in pressure cooker or stovetop pan. The ratio of rice & water is 1:3.5. It takes very long time to cook Mappillai Samba in both pressure cooker & stovetop pan method. So we have to heat the water first and soak rice in it for minimum 2 hours before cooking. Even then it will take around 25 to 30 minutes for complete cooking. The taste of rice is great! how many whistles in cooker?? Hi, I guess that you want to know the rice preparation method using Mappillai Samba rice. I generally keep the flame high until the first whistle whenever I use cooker. After that I reduce the flame to low and retain it for 5 to 10 minutes based on the variety of the rice. I do not count the whistle sound like some people do usually. I made Mappillai Samba rice only once, that too long ago. But recently I have started making Kavuni rice (plain and sweet both) using stovetop method. To make cooking faster, I soak the rice for minimum 8 hours before cooking.